When you do anything to a high level, when you’re a professional in any capacity, you always have a backup plan. Under ideal conditions, things will go according to plan, but conditions are not always ideal. Under ideal conditions, I like to shoot with my Nikon D800 and have all of my lenses near me, ready to go. As a backup, I have a Sony NEX-6 with it’s own lenses as well as a Nikon lens mount adaptor. This camera is compact and does everything my Nikon can, only not as well. But sometimes even that isn’t enough. Sometimes you need a backup point-and-shoot camera. This is the camera that can hide in my pocket and quietly slip out for a photo at a party, or that can live in my backpack and ‘be there’ for unexpected situations where a decent camera is required. For years, my backup-backup was the Panasonic DMC LX3, which I recently sold to a friend. It was small, had a reasonably fast lens with a useful focal length, and could shoot in RAW format, so I could process the photos in Adobe Lightroom later. 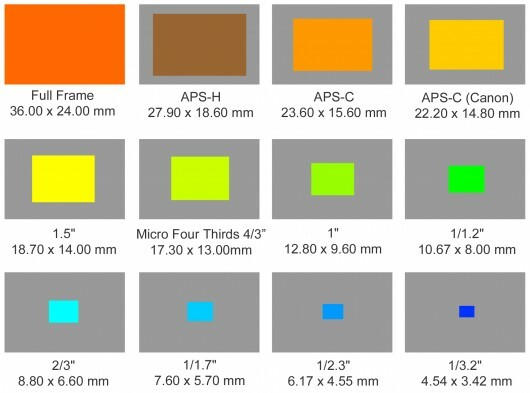 Unfortunately, despite all the positives, its image sensor measured only 1/1.7″ across, which while slightly larger than most compact cameras (1/2.3″) was still much smaller than APS-C (the size of most digital SLR sensors, and the size of my NEX-6’s sensor) and tiny next to my D800’s ‘full frame’ sensor, see the chart below for a comparison of sizes. The size of the sensor is important because it is what gathers the light – It’s all about light. The main reason that photos that come out of digital SLR cameras are so much nicer than those which come out of compact point-and-shoot cameras is because of the size of the image sensor. Larger sensors can gather more light – it’s really that simple. The fact that you can fit more pixels onto a larger sensor is largely irrelevant (and thankfully, camera manufacturers have finally abandoned the ‘mexapixel race’). You can see better when there’s more light, and cameras can take better photos when they’re able to gather more light. Luckily, camera manufacturers have detected that people are starting to understand this, and smaller cameras with larger sensors have been popping up at product announcements quite a lot recently. Of course, there are a whole host of interchangeable lens cameras (ILCs) such as the Sony NEX system (APS-C), the Nikon 1 system (1″ sensor) and the Olympus/Panasonic micro four thirds system. Of course, having interchangeable lenses also makes the cameras bulky and they are rarely pocketable. What I was really after was a fixed-lens camera (not having to worry about a lens mount allows the camera to be smaller) with a large (at least APS-C) sensor shoehorned into the body of a compact camera. Not only would it have to be a fixed lens, but likely a fixed focal length. In the entire world of compact cameras, there are only three which satisfy these criteria. 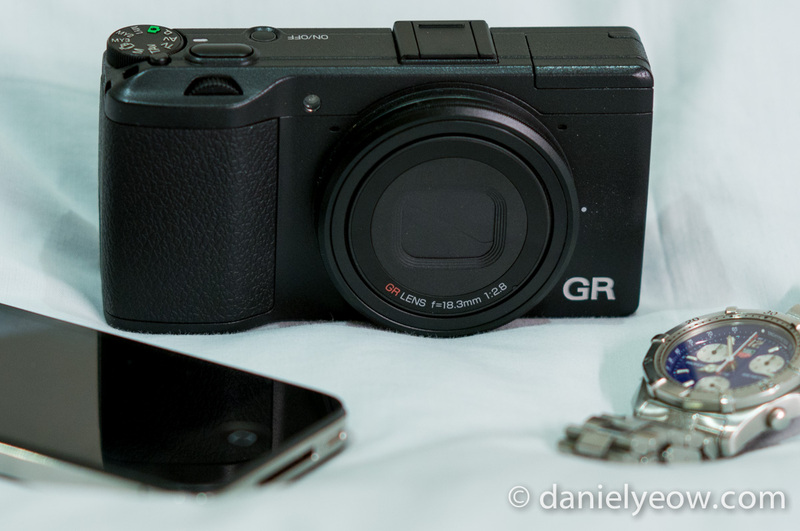 The Nikon Coolpix A, the Ricoh GR, and the Sony RX1. I quickly eliminated the Sony simply because it was a little bit too big, and also because it was very expensive compared to the others (this is only a backup camera, after all). In the end I picked the Ricoh because it is smaller, cheaper, and appeared to have slightly better image quality. …is the one you have with you. Most people who know me know that I have something of a love-hate relationship with my big SLR. It’s so big and heavy that I don’t like carrying it around, but it takes such good photos that I invariably do carry it around quite a lot. I rode a horse through Mongolia with my big SLR strapped to my shoulder, and it gave me big bruises on the side of my leg (as well as one or two nice photos). For ‘important’ jobs, or instances where I know I’m going to need my camera (i.e. when travelling on horseback through Mongolia) I will always carry my SLR, and usually with the standard 24-70mm f/2.8 lens. However, I won’t have that camera and lens on me most of the time, for those impromptu everyday situations where I see something interesting and think it deserves a photo. The kinds of photos that people generally take with their phones. All those readers out there who use a compact camera as your primary camera, ask yourself: which specs have been useful? I’d be willing to bet that most – as much as 90% of all the photos you’ve taken which you consider to be ‘good’ were taken at the widest end of the zoom range. On most compacts, this was the equivalent to a 35mm focal length, and on some more recent compact cameras, it is slightly wider at 28mm. Not only that, but photos taken at the long end of the zoom range are almost always not very good (especially if you have a camera which uses ‘digital zoom’). Compact cameras have been marketed mostly based on specs and features that are either very rarely used, or not relevant to good photo-taking. Curiously enough, now my Ricoh probably takes more photos than either my Sony or my Nikon, simply because it is so small and light that I really do carry it with me everywhere. The lens retracts into the camera body and there’s no lens cap to worry about (a problem on the Panasonic). Another nice thing about compact cameras is that they have what are called ‘leaf shutters’ which is a small shutter placed inside the lens. This is different from the more normal ‘focal plane’ shutter which sits right in front of the sensor. Leaf shutters are not practical on interchangeable lens cameras because you would have to put them in every lens, so it’s just easier to have one shutter mechanism at the focal plane. In a fixed-lens, fixed focal length setup, you can put the shutter anywhere you want, so the best place to put it is near the aperture. Why? Because that’s the narrowest point where light passes through, and so the shutter doesn’t have to move as far. This has two main advantages – the shutter can synchronise with the flash at a much higher speed (up to 1/2000 of a second, normal SLRs can only sync up to 1/250), and the shutters are also much quieter. The controls are also very intuitively laid-out and there’s a lot of room for customisation. I use the three customisable buttons to control ISO, the self-timer, and the ‘crop’ mode. The camera’s lens shoots 16mp photos at a 28mm focal length, but in crop mode it shoots 10mp photos at 35mm focal length, which is my favourite focal length (who knows, maybe someday I’ll get a Sony RX1). Something I also like about this camera is that it is so small and understated that it really does just look like a crappy compact camera. It doesn’t raise any eyebrows, or attract any unwanted attention. I also don’t look like a “photographer” which is my preferred way of working – to be invisible in the background of things. Until last year, I had to either cary a large and imposing camera around and shoot around people often enough that they just got used to it and ignored me, OR compromise on image quality (as if that was ever going to happen), but now I get to have SLR-quality photos in a compact camera body with the only disadvantage being that I’m limited to a single focal length (and maximum aperture of f/2.8). If you only own one camera, and don’t have much a budget, then make it this camera. Anything less, and you may as well just keep using your phone. If you have more money to spend, then I would recommend something like a Fujifilm X-M1, or going higher still, a Sony NEX-6 (or its spiritual replacement, the a6000), although I really wish Sony would make better lenses for its cameras (I mostly use mine with my Nikon lenses and a lens mount adapter). If the world was fair, this camera would outsell every other compact camera. Perhaps the reason that it doesn’t is because it’s ahead of its time. People can’t quite wrap their heads around a compact camera that delivers SLR image quality, so they go to their ‘trusted’ big brands. Or maybe its lack of success is because it looks so understated, in an age where everyone’s trying to make a statement about themselves (Fujifilm has caught onto this by designing its new line of cameras to be very ‘hipster friendly’ with their retro looks). I wish it had a faster lens. f/2.8 is pretty fast, but I’m used to fixed focal length lenses with f-numbers two stops faster (f/1.4). Even an f/2 or f/1.8 lens would make a big difference, although I understand that it may be a challenge to fit something like that in such a small space. I would also redesign the flash, either by adding a diffuser of some kind or tweaking the mechanism in such a way that you can point it straight up, to bounce the light off the ceiling and get a more even spread. Finally, I would improve the autofocus. It’s good, but it’s not that good, I would take the now-common step of placing phase-detect AF points on the image sensor itself, and thus be able to use much quicker phase-detect autofocus, instead of the more primitive and slow contrast-detect. I’m quite sure that at least that last suggestion (about autofocus) will make its way into the next iteration of this camera. Finally, wifi functionality would add an ability to load photos straight from the camera to one’s smartphone, as well as the ability to use a phone to control and take pictures with the camera (remote shooting). Of course, none of those things were deal-breakers for me. This camera takes great photos, and is small and light enough to always have with you. Its controls are highly customisable, and its understatedness lets you take it places where an SLR might not be welcome. In other words, buy this camera; you can’t go wrong. Hi John, thanks for the comment and kind words.